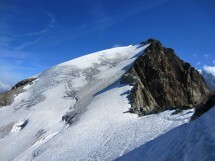 On Sunday, February 12, if the weather is ok, I organize a snowshoe hike to Tête de Moëde 2459 m.This summit of Fiz Chain, dominates all around and offers a magnificent view to Mont Blanc, Buet, Pormenaz, Anterne (lake and mountain) …… ..
We start from Plaine Joux (1365 m, passy, Sallanches) and pass to Ayères and go up to Col d’Anterne 2257 m. From the Col we climb the ridge to reach at Tête de Moëde. Options: From Col d’Anterne, do not climb to Tête de Moëde (in case of freezing) and get off to Lac d'Anterne 2063 m and return up to the Col. Or go down to the refuge of Moëde-Anterne and go to the Lac De Pormenaz …. Elevation gain 1110m (Lac 1160m). Distance: 18 km (Lac, about 19 km). Maximum 12 peoples experimented and sporty hiker. In case of bad weather the hike will be moved or canceled. Equipment: Good mountain shoe, snowshoe, hat, glove, gaiter, warm and waterproof clothes, sticks, picnic, drink. … All participants must be well-prepared and have all equipment with them. Do let me know whether you will come by car and if you are an Oxygène member. Write me please your mobile number and your e-mail.